I absolutely ADORE the early 19th century. It's one of my favorite periods of time for books and movies to be set in (hello? Jane Austen anybody?). One of the things I especially find interesting is the fashion. Ladies dresses were flowing, light, and easy to move about in. This is the era right before the big, stuffy dresses of the Victorian Age. Well, imagine how excited I was to read By the King's Design! Our heroine, Annabelle (Belle) Stirling, is SO likeable and easy to root for. She has inherited and runs her family's drapery shop on her own, providing the best fabrics for dresses and furnishing to London's elite. Rising in fame, she becomes a draper in the building of the Prince Regent's (the future King George IV) new palace. Belle faces the difficulties of establishing her work as a woman and of course, there's a swoon-worthy man involved, even if he does have a giggle-inducing name (Putnam Boyce). The one thing that irked me was Belle's brother, Wesley. He was a very charming man and the true owner of the shop, even though he let Belle run things on her own (a good decision). He had many problems and made horrible decisions, yet Belle never opened her eyes to this. She almost blindly followed and accepted him, even when it threatened her shop, reputation, and life. It was hard to see such a strong woman be dragged down by a weak man. As I mentioned at the beginning, the history is what really made me love this book. The Luddites (people who strongly opposed the upcoming Industrial Revolution and sought out to destroy as much as they could) were one of my favorite parts. I wish we could've read more about George III, the 'Mad King,' as he is one of my favorite historical figures, but his son, the lavish prince, was good enough! The plot was fun, the characters well developed, and I can't wait to get my hands on Christine Trent's other books! 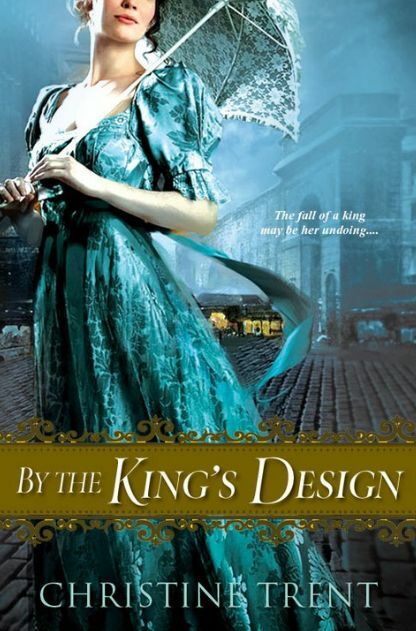 One of you can have a chance to win a copy of By the King's Design! Just fill out the simple form here to enter. You have until February 14th. Great review, Kelly! I am so thrilled that you loved By the King's Design, Christine Trent is a wonderful author! Good luck to all who enter the giveaway and thanks to Kelly for hosting the tour! Great review! This is an author I've been wanting to try. Wow! I love historical fiction and have never read anything about the Luddites. I would love to win this book. This sounds so good. I've wanted to read this one and your review just solidifies that. The Luddites are one of my favorite periods of time to learn about. With all our technological advances, sometimes I think I can relate to them. Awesome review!